Published: February 1st 2016 by UIT Cambridge Ltd. Both inspiration and practical information for any bride wanting to plan and grow their perfect wedding flowers For anyone who wants to add a personal element to their wedding, care for the environment, and save money while they do it, Grow Your Own Wedding Flowers is a must-have book. 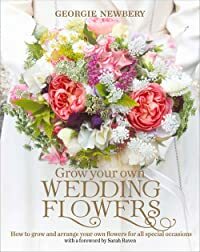 Filled with gorgeous pictures for inspiration, and written in a friendly, no-nonsense style, this practical book makes growing and arranging your own wedding flowers both achievable and fun, whether you are a beginner or advanced gardener or flower arranger. It takes you through how to grow, cut, plan, and arrange flowers, seasonal planting plans for spring, summer, autumn, and winter weddings, and ideas for planted wedding flower arrangements. Step-by-step guides cover the bridal and bridesmaids’ bouquets, flower crowns, wrist corsages and boutonnieres, table centerpieces, garlands, pew ends, and fresh- and dry-petal confetti. From jam-jar posies to elaborate arrangements, Grow Your Own Wedding Flowers has everything you need.